The heritage of Girard-Perregaux’s acclaimed Tourbillon with three gold Bridges places itself squarely in the twenty-first century. Combining noble materials and a high-tech finish, its elegance and majestic architecture underscore its singular character. A rarity limited to 50 pieces. 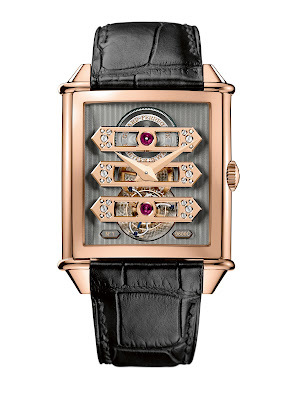 Fashioned in pink gold, the case and the bridges form a striking contrast with the color of the main plate. Its matte anthracite coating is the result of a particular combination of precious materials similar to platinum and draws on cutting-edge technologies. Other elements, such as the barrel, the lower gearwheel bridges and the bridge supports, adopt this finish, resulting in a stunning visual effect. The satin-finished skeletonized bridges, with their pure, contemporary geometry, are the fruit of extremely delicate design: first finely openworked, they are then carefully hand-polished. Seven days are necessary to obtain a perfect finish, since the numerous closed angles form a considerable challenge. The tourbillon system also requires special attention, as its 72 components must be meticulously assembled inside a diameter of just 12 millimeters. To cap these feats, a precious matte anthracite coating gives this timepiece its distinctive personality.